Here's another tidbit to ponder during the Holy Week, especially for deacons and deacon candidates. Most folks are familiar with Fr. Thomas Merton, OCSO. On 19 March 1949 he was ordained a deacon, and he wrote the following reflection shortly after his ordination. 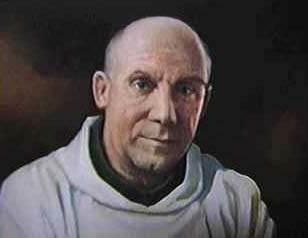 As you read it, please keep in mind that in 1949, the Latin Church still had the longstanding "cursus honorum" ("course of honors") by which a man entered the clergy through a rite known as Tonsure, then progressed up the "minor orders" of porter, lector, exorcist and acolyte. He then moved on to the major orders of subdiaconate, diaconate and priesthood. The fact that the diaconate was known as one of the "major" orders explains the starting point for Merton's reflection, but as you will see, it doesn't exhaust its meaning for him. The first thing about the diaconate is that it is big. The more I think about it the more I realize that it is a Major Order. You are supposed to be the strength of the Church. You receive the Holy Spirit ad robur, not only for yourself, but to support the whole Church. So diaconal service, far from being focused on menial "tasks" can be seen in quite a different light. I believe that it ties in nicely with our earlier reflections on the servant-leadership to which the deacon is called and ordained. Deacon Bill... Thanks for that quote from Fr. Merton. I like that broader view of the Diaconate. It is much fuller and richer than the idea that many have, which is that the Deacon is primarily to be a social worker with the robes and altar stuff as meaningless extra. As a candidate for ordination in August 2012, these are wonderful words to ponder. Thank you for this -- a favorite quote from one of my favorite writers. Merton writes even more in his journals about being a deacon and singing the gospel at mass. He also dedicates his diaconate to Mary, praying "Lady, let me be your deacon..."
On the day when we recall and re-enact the washing of the feet, I am bothered by the negative connotation of performing menial tasks or even doing "social work." Surely the real strength of the Church IS humble service to those in need.